When we were young, one of the first things we asked of our parents was "tell me a story." After all these years, that hasn’t changed, and we all are still entertained by great stories. Harnessing the power of a story to make guests fall in love with your brand is a WISE trait of successful tasting room employees. There is a legendary story about a wine called Black Chicken. It’s a great story about the owner of Biale winery, Aldo Biale. During the 1950s and early 1960s, Aldo’s family grew fruits and vegetables and sold and delivered to customers what was in season. Aldo also had a small vineyard of Zinfandel grapes and, unknown to anyone but his closest friends, he was making wine out of the vineyard. Even his family knew nothing of it, and he especially wanted to keep it secret from his mother. Aldo’s friends loved his Zinfandel and frequently asked if he would sell and deliver the wine to them. Aldo didn’t want to get into trouble with his mother for making wine. At that time the phone systems were party lines, which meant that anyone from the operator to any of your neighbors could listen in on your phone conversations. Aldo came up with a plan. He instructed his friends to ask for a black chicken when they placed their grocery order and he would include a bottle of Zinfandel in their order and deliver it. The code word caught on, and for quite some time Aldo sold a lot of "black chickens." When Biale Winery was established, Aldo proudly kept the name Black Chicken for his special vineyard select Zinfandel. It is one of the best-selling Biale wines to this day. Oct. 25 marked the 12th annual Pinot on the River festival benefiting the Boys and Girls Club of Central Sonoma County. 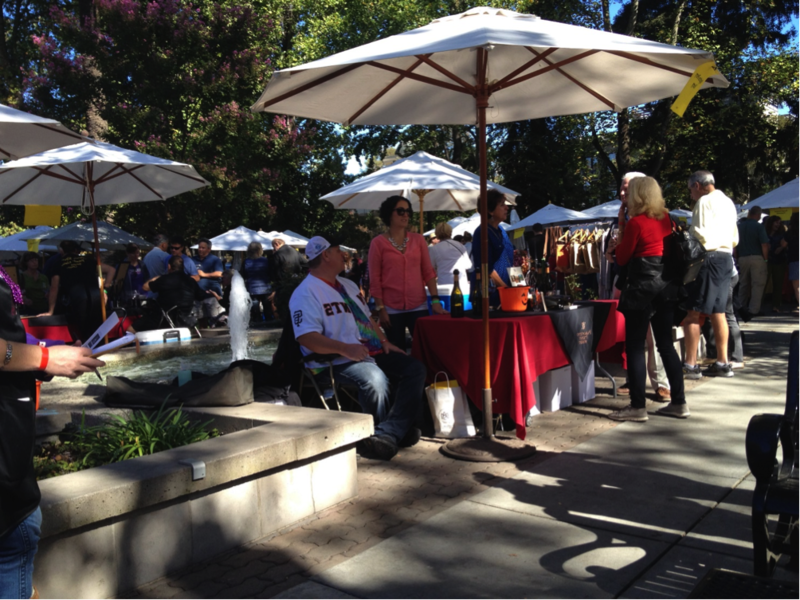 I did not expect such a crowd, much less the more than 100 wineries pouring their best Pinots on the Healdsburg Plaza. So what’s the difference? Beside the marketing appeal of ratings and “rarity complex,” you, the professionals of the direct-to-consumer world, are what promote the brand and position your winery's products to the level consumers will pay… Thank you for being part of the growth of the North American wine industry. Video - Does Your TR Staff Know How To Sell? People may not remember what the alcohol content is, they may not remember the blend, but what they will remember is the emotional connection they made to your brand through the power of your storytelling. Telling memorable, relevant stories is a core WISE trait of successful tasting room professionals and all great sales people. Visual imagery: Can you paint a picture that customers can conjure up later and relive the story? Humor: We all usually remember when someone made us laugh. Dramatic appeal, suspense, surprise: Will your listeners want to hang on your every word to find out how it all ends up? After all, we are entertainers! Gestures: Don’t be shy here, add some life and be as dramatic as is appropriate for the story. Emotional connection: Remember that customers will buy when you can engage their emotions, and they usually won’t buy without that connection. Does your story have an emotional element? Can we appeal to the customer’s sense of enjoyment of life, exclusivity, bragging rights? Solid ending: Is there a happy/meaningful conclusion to your tale? Does it illustrate a lesson on your brand or a specific wine? Substance: Does your story have depth and grip and guts to it? The owner’s family and history: Are there any skeletons in the closet? Any geniuses? Any dentists who became vintners? Why did they start the winery? The winery property and the building’s history: Was the building previously used for something else? Are there ghosts? Funny things other guests have said. This whole topic of stories is a great one for team meetings. Get your staff involved and see what stories are resonating with your customers. When guests laugh, what did they laugh at? What story closed the sale of wine or a club membership? Once you know what your most compelling stories are, be sure to start a written library of them so that new employees can read them and learn all your great stories before they have some of their own. Now, tell me a story! Lettie Teague of the Wall Street Journal narrates her trip to 3 million-case wine producer Chateau Ste. Michelle in Washington state, where the essence of the guided tour was “telling the Chateau Ste. Michelle story,” educating visitors about the state, creating “fond memories,” entertaining visitors and creating future “ambassadors” for the brand.” Read the entire article at the Wall Street Journal. All indices are up again for the September 2015 categories followed by Wines & Vines. Read this and more here. There's big news for those looking to sell “distilled spirits” in existing tasting rooms. A new law means the practice will become legal for California spirits producers starting Jan. 1. Since the law is complex, I’ll let Sonya Sorich of the Sacramento Business Journal explain in more detail. For your general wine education…A new study strengthens the case against soil minerality… Read more in this article by Darren Smith. The San Francisco Wine School recently opened a new expansion for students looking to advance their careers or pursue their passion for wine. The new outpost is the largest in the United States. ePourTechnologies Inc. launched a new product to help pour glasses of wines in a consistent manner. North America is the King of Online Wine Shopping. Right? Not so fast…Associate editor Andrew Adams takes a closer look at the facts, and the good news is that we have a lot of room to grow when it comes to online sales. Texas: The Inifinite Monkey Theorem urban winery founded in Denver, Colo., in 2008 is opening a new branch in Austin, Texas. Wines & Vines contributing editor Jane Firstenfeld explains the appeal of urban wineries in dynamic cities like Austin. Michigan: Many Michigan wineries make use of the five-year old law that allows wineries to charge for tasting and sell wines by the glass to grow their businesses. Read more about the practice in this article from Crain's Detroit.